Published: Dec 26, 2014 · Modified: Jul 3, 2018 · By Jen Sobjack · This post may contain affiliate links. 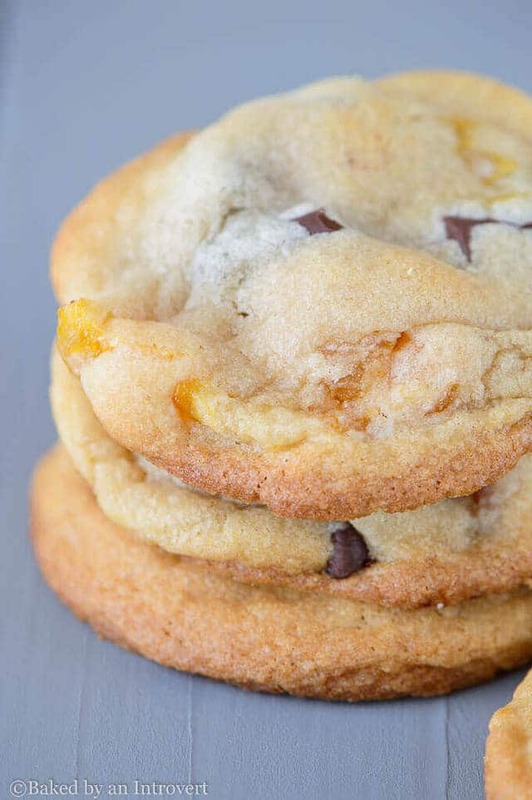 Perfectly chewy and thick chocolate chunk apricot cookies. One of the best flavor combinations ever! How was your Christmas? Did you get your feast on? No matter how much I stuff myself; there is always room for cookies! Even more so, a cookie that is super chewy. 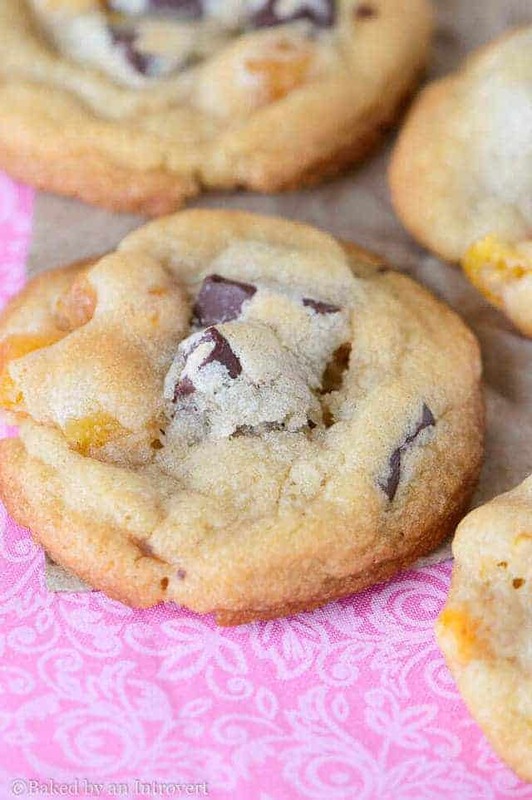 These cookies are full of chocolate chunks and dried apricots. You won’t be able to stop at just one! These cookies were inspired by a Better Home and Garden magazine I picked up recently. In this magazine was a recipe for the best chocolate chip cookies. That’s right. They used syrup, not starch. And when I put this to the test, the cookies superseded the cookie test: remaining ultra-chewy for days. Thank you Better Home and Garden for teaching me something I will use from here on out. I took my long-time favorite Chocolate Chip Cookie recipe and made slight modifications to it. I also increased the batch because, well, who wants to make only 14 cookies? Trust me, you will want way more than that. I adore this thick and chewy chocolate chunk cookie. And they’re even more fantastic with the addition of dried apricots. I love it! Chocolate and apricots are an impeccable combination. And these cookies are full of both! In a large bowl beat together the butter and shortening with an electric mixer. Add both sugars and beat until fluffy. Beat in the eggs, corn syrup and vanilla. In a separate bowl combine the flour, baking soda, and salt; stir with a whisk. Add the flour mixture to the egg mixture, beat until combined. Stir in the chocolate chunks and apricots. Cover and refrigerate dough for at least 2 hours. Preheat the oven to 350ºF. Roll the dough into 1 tablespoon sized balls and place 2 inches apart on a baking sheet lined with a silicone mat. Bake for 10 to 12 minutes or until lightly brown and just underdone. Cool cookies on the pan for 10 minutes. Remove from the pan and cool completely on a wire rack. These cookies look amazing. I like anything with apricot and chocolate. It’s a great combination. Thank you so much, Analida! Hope you had a wonderful Christmas, Jen! There is always room for cookies, especially soft and chewy ones! Love the apricots in here, they look phenomenal! 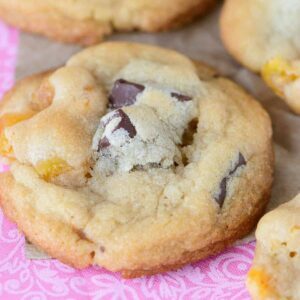 I am loving the addition of apricots to these cookies… I love their sweet flavour and texture and think that they do not get used enough in baking. This is such a perfect cookie for me and definitely a recipe I need to make! I agree, Thalia. Apricots are too often over looked. Thank you so much for reading! 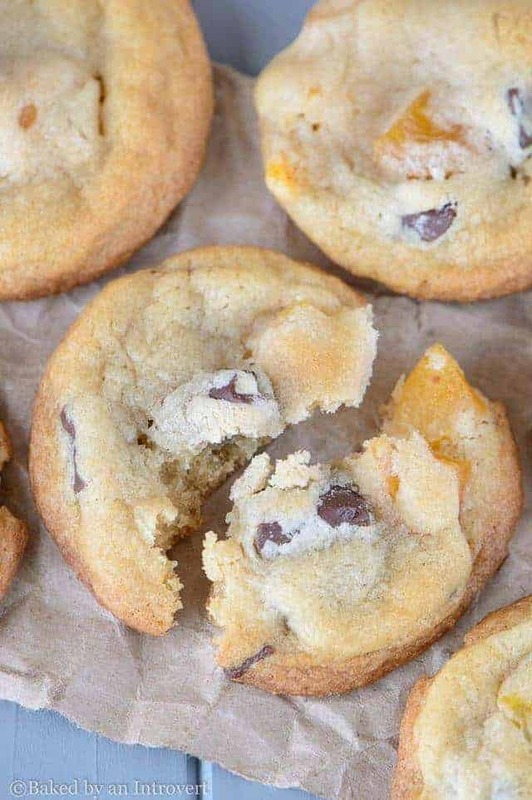 I love the idea of fruit in a chocolate chip cookie! These look delicious! It turned out incredible. I recommend putting all fruit in a cookie!! totally drooling over these cookies Jen!! Gorgeous! Pinned. Thank you so much for pinning, Manali! These look so wonderful! 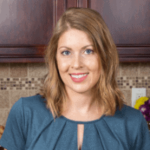 I just found your blog and am having a blast looking thru all your beautiful recipes – All your pictures are so gorgeous!